If you are interested in storytelling, but don't know where to start, this workshop facilitated by Sheila Wee, is for you. In 10-hours (over one weekend) of hands-on training, it will give you a firm grounding in storytelling skills. You will leave the workshop with one ready to tell story and the tools to learn and tell more stories. In a warm and supportive group environment you will learn why storytelling is such a powerful form of communication; how stories can be structured to hook listener's attention and discover your own personal storytelling style. Through group, partner and individual exercises, you will be guided through a step-by-step method of learning to tell a story without memorising the words. You will also discover how to add details to make the story uniquely yours, and learn effective story rehearsal and performance techniques. Sheila Wee is a Singaporean professional storyteller, storytelling trainer and story consultant. Because of her work to pioneer the movement to revive the use of storytelling in Singapore, she has been described as a Godmother of Singapore storytelling. Her storytelling has been described variously, as warm, engaging, elegant and captivating. Sheila's storytelling experience over the last 19 years has been deep and wide ranging. She has curated and performed exhibit specific performances for museums, trained tourist guides and docents for museums and art galleries to use storytelling their tours, trained teachers and lecturers to use storytelling in their teaching and corporate, military and civil service leaders in the use of storytelling as an organisational tool. 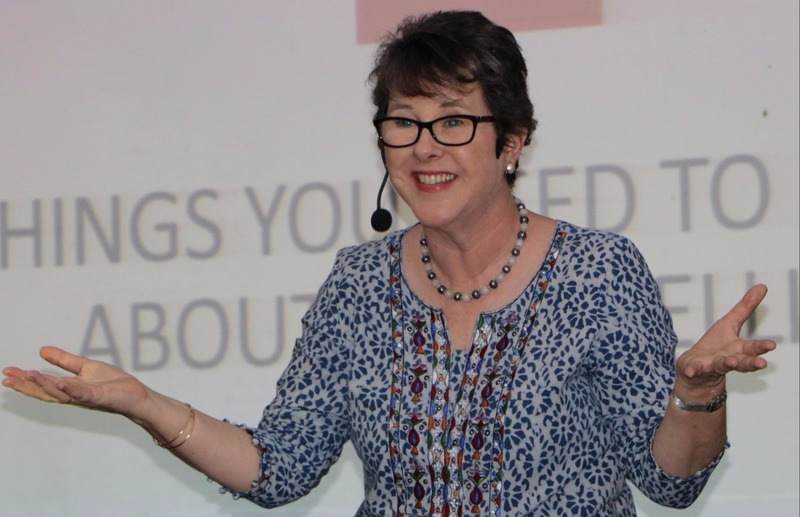 Sheila's highly practical workshops have garnered consistently high ratings from participants. In Singapore, her workshop clients include: Lee Kuan Yew School of Public Policy (NUS), Yale-NUS College, NUS Libraries, Singapore Management University, Duke-NUS, Singapore Institute of Technology, ST Electronics (Centre for Management Development), Aventis School of Management, Singapore Tourism Board, The National Gallery, Ministry of Education, Singapore Press Holdings, AIA, Nanyang Technological University, National Parks Board, MND, HDB, NParks, EZ-Link and Sentosa Development Corporation. Sheila also works internationally, and has performed and conducted workshops in Australia, Hong Kong, India, Indonesia, Kenya, Malaysia, Philippines, Thailand, UK and Vietnam. As well as running her storytelling company Storywise, Sheila is a Director of Story Connection, a non-profit company she set up with fellow storyteller Roger Jenkins, with the aim of stratheing community through storytelling. Story Connection's major annual events are athe Story Carnival @ Enabling Village and the 398.2 Storytelling Festival. Sheila is also a Founder Member and past President of the Storytelling Association (Singapore). "A fantastic workshop. Every second is worth a million! Thanks a lot for waking up the storyteller in me." "Sheila came across as very sincere and passionate about sharing her expertise in storytelling. She not only taught us how to tell stories, but inspired us as well. The workshop was also well paced with a very relevant and well planned programme." "I thoroughly enjoyed the workshop! Really benefited from the session and am looking forward to using what I learnt back in school with my students. Thank you so much!" "Sheila showed that she has deep knowledge in storytelling and she was able to give useful/practical/easy to understand examples too. What I liked most was that she shared with us lots of ideas, so we can choose the best which is applicable to us. My time and money were well spent." "Sheila is very approachable and engaging. The workshop is rather empowering too; I always thought I can't tell stories, but now I believe I can." "Would recommend it to others. A solid introduction. Inspiring." "Well organised and paced. Fantastic attention to detail." "Sheila is an outstanding and humorous Storytelling Expert. It's my honour to be able to learn from her. Simply Great!"